Deciding to have your kitchen remodeled is a big, exciting decision. The kitchen will hopefully last you a very long time so you want to make sure that you are 100% satisfied with it. Most people get wrapped up in the excitement and stress that they don’t think thoroughly about what they really want and need.  Storage – You must keep in mind how you want to use your kitchen for storage. Do you want a large walk-in pantry? Do you want special drawers for Tupperware? Even think about the location of everything; maybe you want the pots and pans right next to the oven or the plates and bowls right next to the refrigerator. The different between some remodeling companies and Republic West Remodeling is that we take all of that into consideration. We come into your home and evaluate how you use your space. We watch you cook dinner, make a snack, etc. to see how you work and how we can better optimize your space. We will also take into account what you like to keep out on a regular basis and come up with a plan to help you better organize it (think secret compartment).  Aesthetic – The first thing you or your guests will see when they walk into your kitchen is not how much storage space you have but what your cabinets, your appliances and your counters look like. You want them to fit your personality and flow with the rest of your home. Although, if the kitchen doesn’t flow with the rest of your home, you have a perfect excuse for a full home makeover. 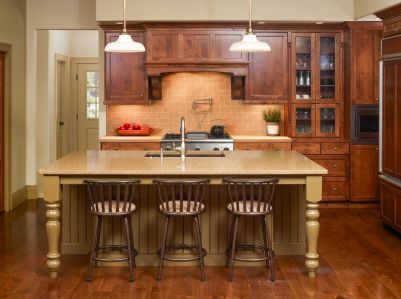 When you trust Republic West Remodeling for your Scottsdale kitchen remodeling, we will help you pick out and coordinate all of the colors, fixtures and materials to make your kitchen just as beautiful as it is functional.  Seating – You kitchen is the heart of your home and the place where everyone gathers. When designing your kitchen imagine your next get together, imagine your children doing their homework, imagine a late night glass of wine with your spouse, and imagine family dinners. What do they look like to you? Having a comfortable place for you and your family to be is a crucial to being completely satisfied. Get your whole family in on it and brain storm how you all want to transform you kitchen sitting area. If you can remember these three things (and we will help you of course), you should be completely, absolutely, 100% satisfied with your Scottsdale kitchen remodeling.